This review was written in August 2007. I must of had a fascination with usb gadgets back then. Welcome to my next review. I really must start by thanking Brando Shopping for sending me another USB product. 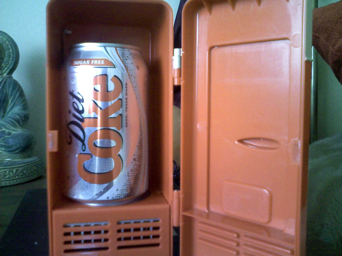 I must admit I was not sure what to expect when I knew I would be receiving a USB Fridge, but nonetheless I was very excited to open the packaging and connect up my new Fridge to my laptop. And what a beauty. I had a lot of curiosity at work, with my boss even trying to steal my fridge. The fridge comes in a large box packaging to protect it perfectly during transit. The operation is very simple. 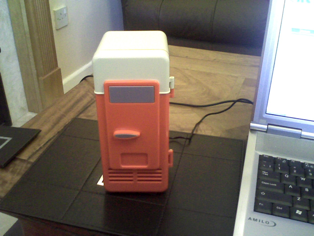 Plug into a usb port, open the fridge door and place can inside. It is as simple as that. A cool gadget and highly recommended.